Before you read this recipe, I need to preface it by letting you know that Cheez whiz earned it’s spot in the recipe. Those of you who think Cheez whiz has no place in a good dish I challenge you to try this. Second, for those who dislike cabbage but do like broccoli and cheese, try this! The man will only eat cabbage two ways: The Neely way and this way. I tried this recipe over the weekend and I had three adults sitting at my dinner table who did not like cabbage. They smelled, they liked, they tasted, they ate and they wanted more. I promise I thought I was eating broccoli and cheese the whole time. 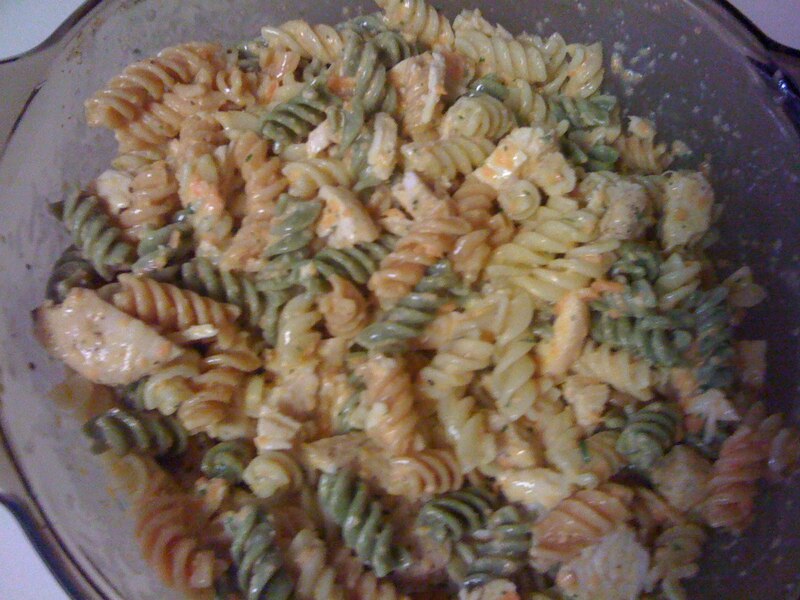 The only thing I changed on the recipe was I left out the jalapenos. I also found out while eating my meal that if you put some green onion in the cabbage, it is DELICIOUS! Some of my green onion from my pasta salad got mixed up in the cabbage and I took a bite and fell in love all over again. This is a picture before it was baked. The great thing about this recipe is that if you are entertaining, you can make this ahead of time. We had a soccer game on Saturday and guests were coming over right after the game. Before the game I boiled the cabbage until it was just done. Drained it, put it in the buttered dish and threw it in the fridge. When I came home from the game I thew the rest of the ingredients together and poured it on top and in the oven it went and was ready in 30min.- same time as the grilled pork chops. 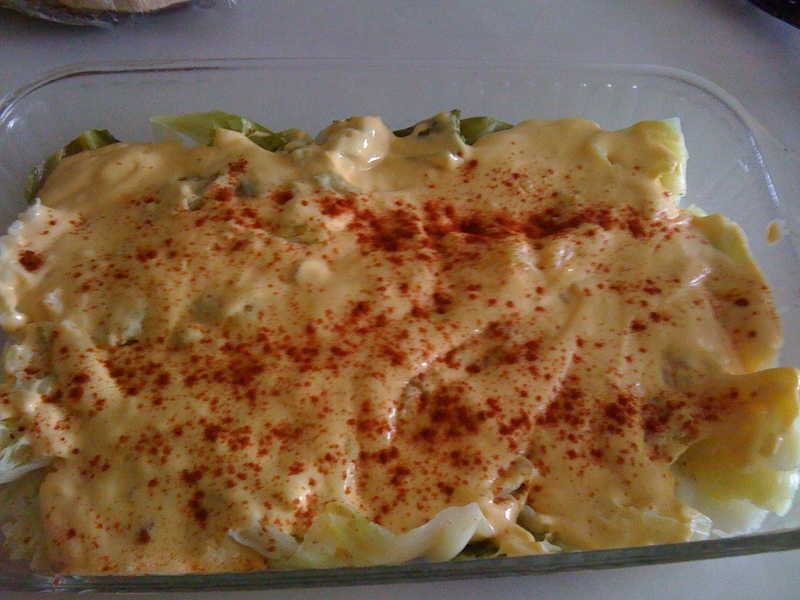 Here is the escalloped cabbage recipe. Everyone knows I love Greek food! I love, love, love it! When I saw a friend on Facebook posted this recipe, I was all over it. This is also another recipe that you can make before hand. I served this with the pork chops and cabbage (we also had stuffing). I was able to make this before the game and right before I set it on the table I tossed in the green onion. About two years ago, a good friend of mine, Galit Hill, said I had to try Jimmy’s Favorite Garlic Bread recipe. I was up for it so I made it. The first time I made it it on sour dough bread just like the recipe called for. Once I got through the outter pieces of the bread into the center, it melted in my mouth. Oh how I loved the softness of the bread and all of the flavors from the garlic butter! I simply fell in love. Now I make it on French bread. It’s just a personal favorite- you could slap this butter on any of your favorite breads. I usually make this garlic bread recipe when we have lasagna. I later told her how much I loved this recipe. She mentioned to me it was delicious on broccoli. I am pretty sure she was also the one who came up with the idea to throw it on pasta and chicken with veggies. This meal is an oldie but goodie around here. The kids truly like this meal. It’s SO simple and it’s also budget friendly. Grill your chicken, boil your chicken or bake your chicken- it doesn’t matter how you do it, just cook it. Shred it. 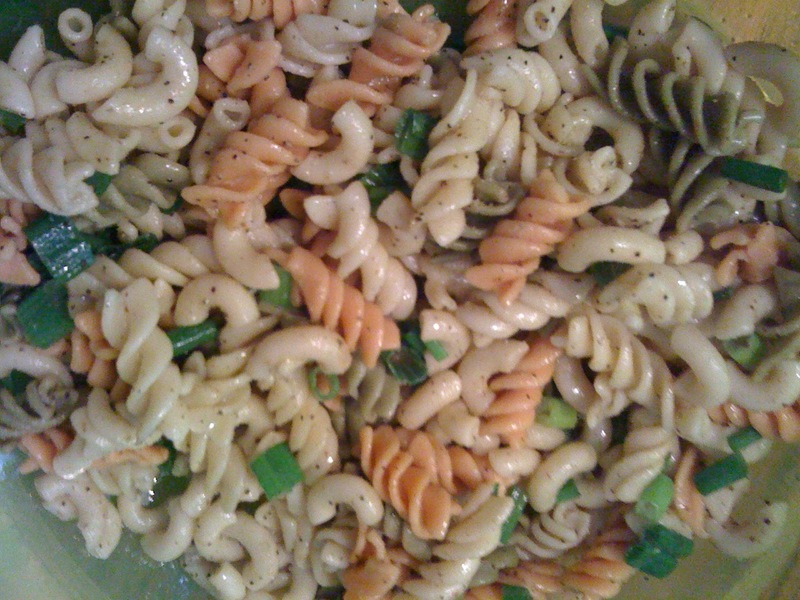 Throw it in with the cooked noodles of your choice. Add whatever veggies you have on hand. Eat it cold or eat it hot. This evening I salt & peppered my chicken and baked it until it was cooked through. I usually like to boil mine because the chicken is softer when it’s boiled. 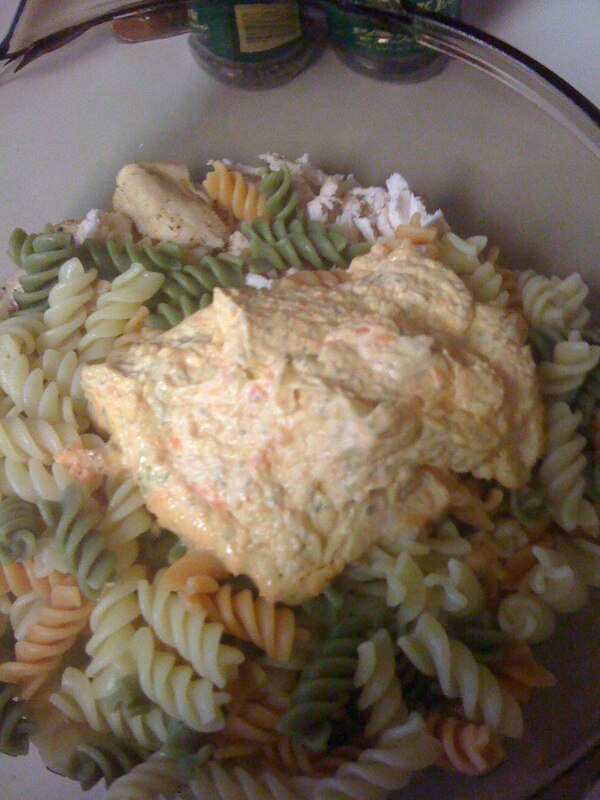 I paired the chicken with Garden Rotini. I only had carrots on hand to throw in there. Because my family boycotts anything that is nutritious, I steamed the carrots, pureed them and mixed them in with the butter. I know what you are thinking, “Why bother with the carrots- with that much butter it’s pointless to be healthy.” Ha, true for some… but for us… this is our healthy version of healthy 🙂 Everything we eat is lathered in butter or bacon grease and has loads of salt- to add any veggies and get them actually consumed by someone (other than myself, I do like veggies) is like waiting on rain to come in a desert.. it ain’t gonna happen. Therefore, I mask the veggies in our food when I can. See, you can just see the slivers of carrots in there. They had no idea that there were carrots in this garlic butter. They ate the whole dish. The point of this blog is that this garlic butter recipe can be placed on just about anything and it will turn out delicious!